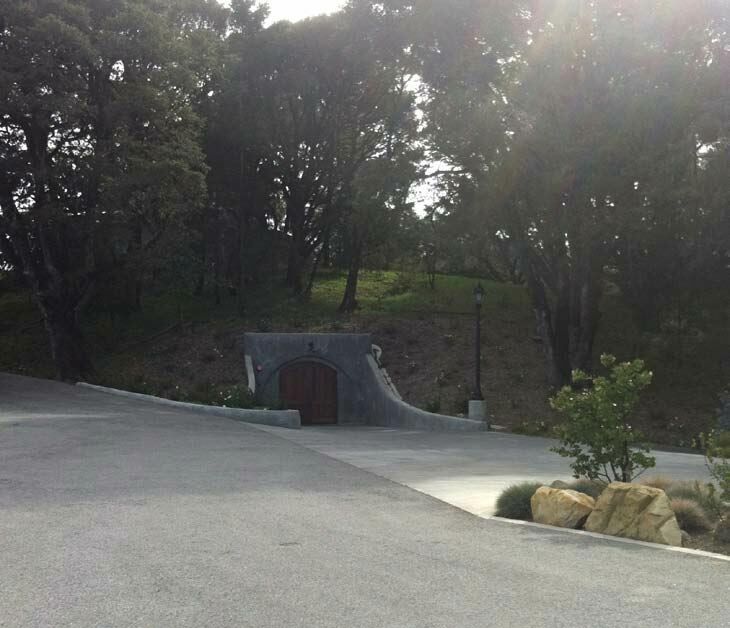 Rhys Vineyards winery facility, opened in 2010, is located inside a 30,000 square foot cave on Skyline Blvd. in the Santa Cruz Mountains. There is nothing like this 10,000-case state-of-the-art winery in the region and it is almost breathtaking in scope. Grapes enter through one cave door, meet with modern sorting and destemming equipment, and progress to 120 (eventually to be 150) 1-ton stainless steel fermenters in mobile pods. Efficiency is the goal, with the winery laid out in a fashion to avoid moving equipment. Water, compressed air and glycol are available everywhere. The result is that the entire harvest can be managed with a small crew. After fermentation, the wines are sent to barrel storage wings of the cave monitored carefully for humidity to avoid concentrating the wines and artificially elevating alcohol percentages. Wines are not racked after barreling until blended for bottling and all wine flow is by the gentle push of bulldog equipment. The finished wines are packed for shipping in a devoted wing of the cave, and wines leave through a second exit cave door. The modest cave entrance shown below belies what is inside. The name, Rhys, is derived from the Welsh spelling of Reese. Owner Kevin Harvey has five diverse vineyards with distinct geological profiles in the Santa Cruz Mountains Two vineyards, Family Farm and Home, are technically just outside the Santa Cruz Mountains AVA but produce wines that are Santa Cruz Mountains in character. The other three vineyards are Alpine, Skyline and Horseshoe Ranch. The first estate vineyard Pinot Noir release came in 2004, and the 2007 vintage was the first in which all five vineyards were in production. A sixth vineyard in the Santa Cruz Mountains AVA, with 18 plantable acres, is currently named Pajaro Vineyard after the Pajaro soils at the site. Acquired and planted more recently, it is located very close to Windy Oaks Estate in Corralitos, and will produce its first commercial harvest in 2015 or 2016. Plantings of Pinot Noir and Chardonnay here are very high density (3.5' x 2' and 3.5' x 3'). A seventh estate vineyard, Bearwallow, is located in the deep end of the Anderson Valley and contains existing Dijon clones planted in the manner common several years ago combined with newer more high-density heritage clone plantings. All Rhys vineyards meet important criteria: shallow soils which limit vigor, soils that are iron-rich, markedly fractured and rocky subsoils which allow vine roots to penetrate deeply, moderate clay content and limited water holding capacity, steep non-forested slopes, higher elevations, and a cool climate. Harvey is a firm believer that higher, rockier sites with thinner soils produce wines with more desirable minerality. Yields from grapes grown in these conditions are typically very low. Harvey has shunned the newer Dijon clones for the most part and instead planted heritage selections such as Calera, Swan, La Tache, Hyde and Wente. In time, vines are identified that produce optimal quality at each vineyard site and some vines are re-grafted with cuttings from these best performing vines. The result is a selection massale or mixture of selections. Rootstocks are Riparia and 120A, known for having the lowest rigor. Rhys Alpine Vineyard is shown below. Picking is done over a several day interval to obtain grapes of variable ripeness, usually in the lower Brix ranges. Grapes are often placed 100% whole cluster in 1-ton fermenters, but the percentage of whole cluster can vary depending on the experiential history with each vineyard. Harvey says about whole cluster, “When it works, it always makes a better wine.” All fermentations are by ambient yeast, and punchdowns are carried out by foot treading. The wines are pressed off with a basket press and gravity fed into 4-year air-dried Francois Fréres French oak barrels. 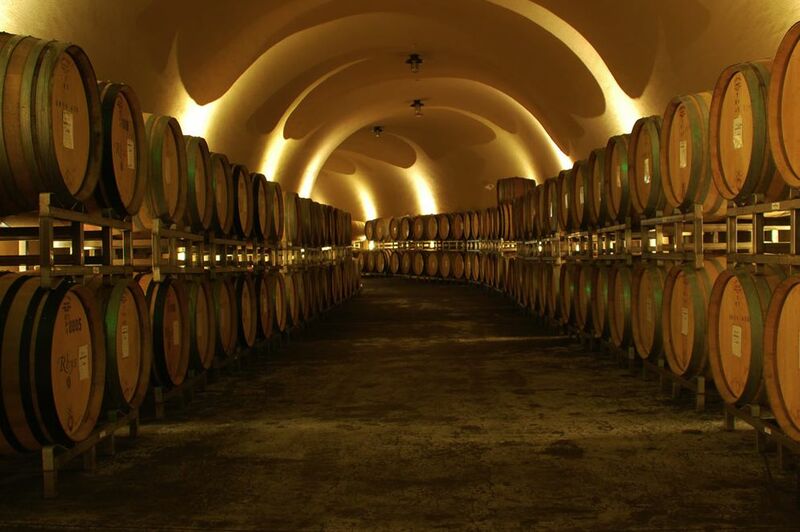 Wines spend approximately 14 months in barrel after which time they are blended. The percentage of new oak varies but is modest. All wines are unfined and unfiltered. Rhys Pinot Noir is not only distinctive for the Santa Cruz Mountains, it is unique among wines in North America. The wines are generally between 12.5% and 13.5% alcohol, but exhibit ripe fruit phenolics. They show no intrusion of oak and have well honed acidity. They are serious wines with many botttlings showing fresh fruit upon entry, but finishing with minerality. A goal at Rhys is to avoid the sweet fruit finish that is common among many California Pinot Noirs, especially those made from deep, fertile soils. The high percentage of whole cluster adds nuance and age ability. Winemaker Jeff Brinkman and Harvey have gradually refined their winemaking based on experience with their sites. For example, the 2007 and 2008 vintage wines had a prolonged period during which they were closed. The 2009 and 2010 vintage wines have not shown that propensity and it is assumed that this is due to subtle winemaking changes such as cool ferments and less extraction. 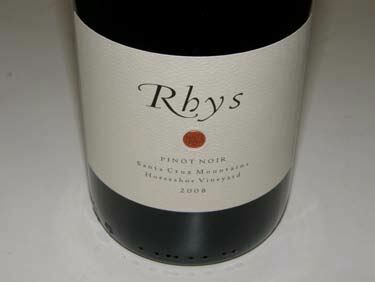 The Rhys Pinot Noirs drink better early since the 2009 vintage but should age just as well. Harvey invited me to taste the 2011 Rhys wines from bottle in the confines of the Rhys cave. I feel quite fortunate to have this experience for two reasons. First, there is a two year waiting list to get on the mailing list to buy Rhys wines (yields were high in 2012 and more people will be added to the mailing list for that vintage). Second, the 2011 production was pitifully low, 25% of normal. Harvey remarked that his next newsletter offering the 2011 wines will be titled, “Never have we fought so hard for so little.” He said 2011 was “California at its coolest.” The wines had been bottled just a few weeks prior. The small amount of wine that was produced is impressive. The Pinot Noirs have plenty of aromatic, flavor and textural interest and there are no sweet, cloying finishes. I also tasted the Horseshoe, Swan Terrace and Skyline 2012 Pinot Noirs from barrel and I won’t torture you with my superlatives. All I can say, this is a Goldilocks vintage where everything is just right. Quantity and quality are equal. Buy every bottle of 2012 Rhys Pinot Noir you can get your hands on! Because production was so low in 2011, the Alesia label (Rhys wines made from purchased grapes) was revived in a search for grapes from a vineyard site that fit the Rhys profile. 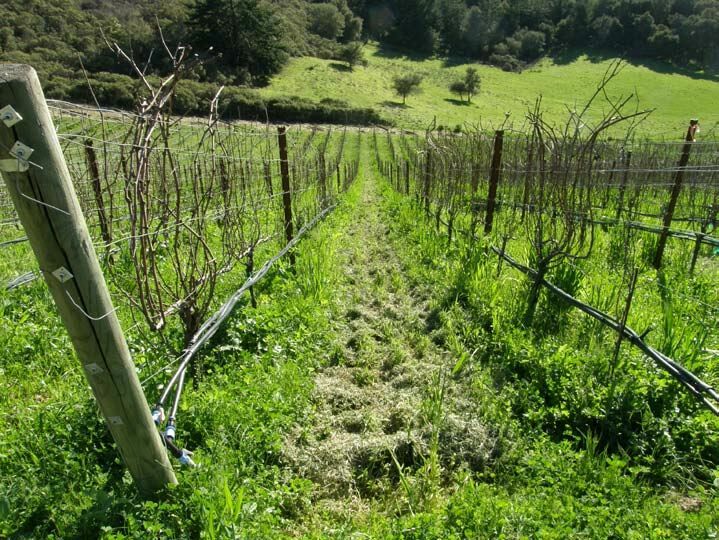 Alder Springs Vineyard in northern Mendocino County was chosen. Situated at 2,500 feet, is quite rocky with sparse topsoils. Chardonnay is one of the most popular wines from Rhys. Normal production is about 700 cases, but this will increase with new plantings at Bearwallow and Pajaro vineyards. The Chardonnays are barrel fermented with no lees stirring since Harvey believes this makes Chardonnay “blurry.” Selections are primarily Wente and Hyde with small amounts of Dijon 76 clone. You need to look elsewhere if you want ripe, leesy, buttery and oaky Chardonnay. Aromas of lemon curd, apple, and wet stones. Restrained flavors of citrus fruits, green apple and quince with bright acidity on a sharply focused finished. Very classy, very good. More aromatic with a slight tropical fruit scent complimenting the lemon notes. Complex, with flavors of lemon meringue, pineapple, vanilla cream and nuts. An hi-tone cut of acidity underlies the fruit and leads to a refreshing, dry finish. Very good. Family Farm and Home vineyards are but 350 to 400 yards apart with similar climates, comparable clones, but they lie in different geological zones and are completely distinct wines from one another. The Home Pinot Noir is exotic with typically aromas of an Eastern spice bazaar. The 2011 vintage is the first to include new plantings at the Home Vineyard which are of higher density with better rootstock and clone combinations. Harvey says the Home “would be a good addition to a Burgundy blind tasting.” Whole cluster is a little too pronounced at 100% with the Family Farm vineyard. 12.8% alc.. 60% whole cluster, aged in 40% new French oak. · Aromas of grilled plum, earth, smoke and peat. Relatively undeveloped and closed, showing some appealing dark berry and smoky plum flavors with restrained, fine-grain tannins. Good. 13.2% alc.. 100% whole cluster, aged in 10% new French oak. · Highly perfumed with exotic spices including cardamom. Juicy and satisfying on the palate, featuring darker stone fruits and berries. The whole cluster really compliments the fruit. Finishes with a dry, focused finish that sports a hint of iron and loam. Exceptional. 50 cases from 14,000 vines or 1 bottle per 25 vines! Usually 100% whole cluster, but cautious in this vintage and reduced to 67%. Price was raised in this vintage and some complained, but everyone asked for more. Harvey calls this a “superstar” vineyard. The Syrah from this vineyard is superb, but the Pinot Noir is so amazing that the Syrah is being grafted over to Pinot Noir. · This wine has it all: highly flavored dark berry and plum fruit, tons of spice, plenty of minerality, beautiful balance, supple tannins, and a focused finish. Exceptional. Horseshoe and Alpine vineyards were tasted in tatum as they close together with the same climate. The soils, however, are quite different, and the resulting wines from each vineyard are dissimilar. This is a good example for demonstrating the role of terroir, specifically soils. Wines from Horseshoe display considerable minerality, both the Chardonnay and Pinot Noir. The Horseshoe wines were great initially, then declined for a couple of years, and now have returned to greatness with the 2012 vintage. Harvey calls the wines from Horseshoe Vineyard “more intellectual and introverted.” Alpine Vineyard Pinot Noir, on the other hand, has its assets as well but does not show as much minerality. A subsection of Alpine, Swan Terrace, is usually bottled separately and is often my favorite among all the Rhys Pinot Noirs, but was included in the Alpine bottling in 2011. 0% whole cluster. · Slight reduction on the nose, disappearing slowly in the glass as fruit appears. The most striking feature of this wine, beyond the delicious dark berry, tea and spice flavors, is the very dry and distinct finish. If you wanted to choose one wine to show a person what “minerality” is, this wine would be a top choice. Exceptional. 0% whole cluster. · Darker fruits with exotic spices and camphor are featured on the nose. Not as showy as the Horseshoe, with more modest fruit expression at this stage. Flavors of dark plum, Hoison, and blackberries with a smoky undertone. The wine is sporting muscular tannins that need time to soften and integrate. Very dry, well-defined finish. Very good. Made from existing plantings of Dijon and Pommard clones. 8’ x 5’ spacing, planted 12 years ago. Almost no new oak, very little whole cluster. · Fragrant with fresh berry compote and vanilla. Juicy acidity elevates the dark berry, plum and pomegranate flavors which end with noticeable presence on a focused, tight and gritty finish. Very good. 40% whole cluster, 45% new French oak. · Deep reddish-purple color in the glass. Aromas of black raspberries and spice. Slightly rustic with black fruit flavors and firm, balanced tannins. Very earthy, showing tastes of iron. Enters with good attack and exits in a slippery fashion with a bright cut of acidity on the finish. Unique. Good (+).